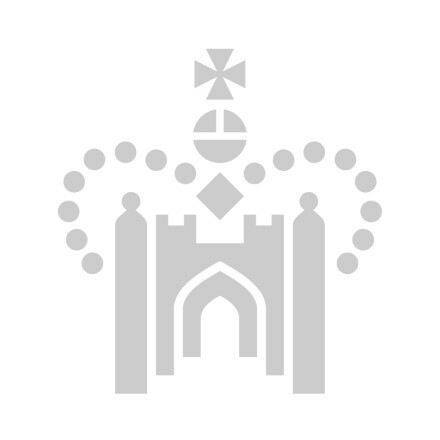 Exclusively designed in the UK for Historic Royal Palaces, the Royal Victoria 100% cotton tea towels beautifully illustrate Queen Victoria's small diamond imperial and state crown, part of of the Crown Jewels held at the Tower of London. Made in the UK, the intricate design takes inspiration from Queen Victoria's honiton lace wedding flounce worn in 1840 and makes for a wonderful gift alongside the Royal Victoria chinaware collection. The Royal Victoria collection is inspired by Queen Victoria, Kensington Palace, her childhood home and her small diamond imperial and state crown. The imperial and state diamond crown was commissioned in 1870 by Queen Victoria, following the death of her husband Prince Albert in 1861. Worn over her widow's cap and featuring 1162 brilliant and 138 rose cut diamonds, the crown was a substitute for her heavier and larger Imperial State crown. Alongside the small diamond crown, the tea towels also draw inspiration from Queen Victoria's wedding dress at her wedding to Prince Albert in 1840. Her cream coloured satin gown was detailed with lace motifs, handmade in Honiton, Devon. Honiton lace was later used for the christening gown of Queen Victoria's children, including Edward VII. The Honiton lace industry continued to receive royal patronage and was notably used for Queen Victoria's diamond jubilee official photograph in 1897.